Confession: I got sucked into swaps as of late. It is highly addictive. Buyer beware. The month of September brought the Teal Mini Swap. This is a fun event organized by Beth Helfter of EvaPaige Quilt Designs to raise awareness and money for ovarian cancer research. Teal ribbons represent ovarian cancer (hence the name). Each participant paid $15, most of which went to the Ovarian Cancer Research Fund. Everyone received a piece of the challenge fabric, which was donated by Blank Fabrics. 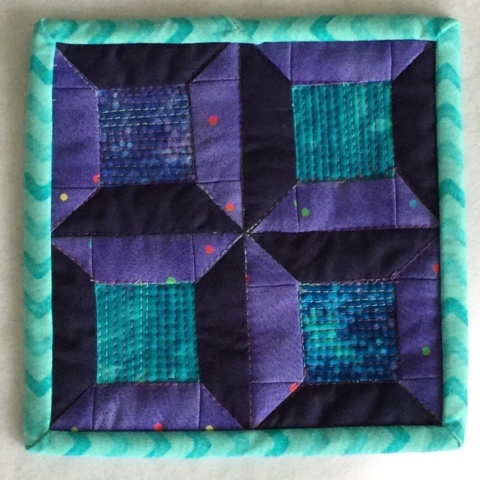 We had a month to make a mini quilt or a mug rug for our swap partner, and we had to somehow incorporate the challenge fabric. Here is the mug rug I made for my partner, Jenny. I happened to have a little kit hanging around with this pattern and fabric from Sew Lux. I thought this was the perfect time to use it, so I just swapped out the background fabric in the kit for the challenge fabric. It was really fun to make! I love the mug rug I received from my partner. 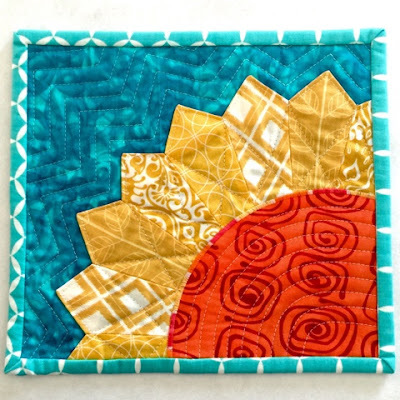 She called it tumbling spools, and it's even quilted to look like thread. It lives right next to my sewing machine. Thanks Jenny! 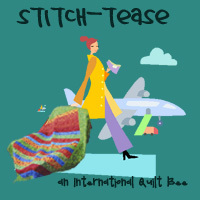 The Teal Mini Swap is an annual event, so join the Facebook group. There is also an informational page here. I hope to see you there next year!